We believe that outstanding products start with a focus on the people they serve. We are a full-service digital agency that specializes in designing, prototyping and building digital consumer products or online communities, such as e-commerce sites, and web or native apps. Working together, our goal will not simply be to roll out a specific set of features. Instead, we’ll start by looking at the people you serve and explore the best way to transform the way they feel when they use your product. This focus will inform our entire creative process from fleshing out the initial concept to developing a cutting edge product with a polished user interface and language that resonates with those who matter most to you. Together, we’ll employ techniques, such as ideation brainstorms, design sprints and rapid prototyping to iterate on ideas and design concepts, efficiently, allowing for ample feedback along the way to help ensure we’re creating products that are intuitive, joyful and most importantly, help serve your people in the best possible way. Ideas come to life through a combination artifacts, depending on your project, that we can put in front of your and your customers, such as storyboards, prototypes, and fully functional web applications, designed for rapid iteration. Working with Mobius Innovations means being a part of a team committed to pushing the boundaries of design and technology to best serve your customers. 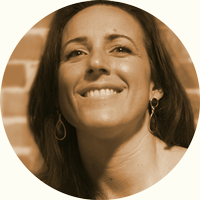 Gina’s specialty is operating at the intersection of art and technology, and she loves exploring the role of empathy in the creative process. Her cross-discipline roots started before high school, coding computer games and developing photos in her darkroom. This trend continued through her studies at Brandeis University, where she received a double degree in Pre-Med and Visual Culture. She is a user experience designer and full-stack engineer. Her experience ranges from global director in the technology division of a New York City advertising agency to designing and building websites, large-scale e-commerce sites, native apps, and web applications, such as the one for her startup, Delightfully, a MassChallenge finalist. In her spare time, you might find her running, traveling, taking photos, or helping kids learn to code, make movies and design products with empathy. We love working with teams who embrace a collaborative style and share our dedication to preserving the human element while pushing the boundaries of design and innovation. If this sounds like you, let’s talk! What else can you tell us about your project? Thank you! We'll get back to you right away about your project!